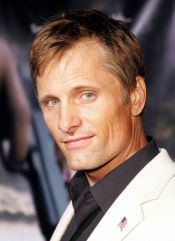 A History of Violence is being released these days, the film of David Cronenberg that Viggo Mortensen stars in and where he manages to exploit to the maximum that curious ability of being now loving now violent that he so well showed in Lord of the Rings. In a few months it will be released in Spain Agustín Díaz Yanes' Alatriste, the most ambitious film of the Iberian film-making, based on Arturo Pérez-Reverte's novels, in which Mortensen plays the main character, a captain of the Spanish imperial army in the XVII century who becomes a mercenary. Sitting on a comfortable armchair at the Four Seasons Hotel in Los Angeles, wearing a T-shirt of his favourite team, San Lorenzo de Almagro, with matching socks and medal and an improvised maté in his hand, this authentic international actor talked to us, in Spanish, about his two new films. Would you say this is the best year in your career with a leading role in the American cinema and another one in the Spanish cinema? In cinema, yes, I would say it is. The process of making A History of Violence with David Cronenberg has been one of the best shooting experiences I have ever had. I haven't seen Alatriste, I have seen some sequences that have turned out really well, but the experiences of preparing the two projects, the shooting work and the teamwork, the actors of the projects who are almost family, are the best experiences I have ever had; being able to do these two projects, one American and one in another language, which is about another culture, another point of view, has been a pleasure and a challenge. An odd thing is that, Cronenberg has received the best reviews among all the directors that work in English and I'm not surprised because he has category, he can do it and has done it well. However, he has not received the awards others have, and he has not had the popular success other directors, not as good as him, have received. I believe it's possible, and I think he deserves it; and with this movie, he will possibly get that. I don't know whether he cares about it, he sure would like it. The truth is he deserves it. I think this film, although it's very complicated and strange, like all his films, it's more accessible, it will possibly be a great success, not only in Europe, Argentina or Japan, but also in the United States. Which country do you think is more violent: Argentina or the United States? In Argentina they had the frontier wars, the war of El Chaco, the slaughter of the Indians, the way the Argentinean nation was built was very similar to the American way. But the same thing could be said about Australia, and to tell the truth, about almost every country in the world. This movie deals specifically with the American violence, the tendency to shoot each other or to kill people, instead of solving problems by speaking, with dialogue. However I don't think this to be an American thing exclusively. I think it's an universal topic, but violence is inevitable. It exists deep inside human beings, although it's also true that, as rational beings, we have the chance of saying "no, let me think a bit, perhaps this isn't the way to solve my problems", as an individual, as people, as nations, all that is in the movie, but I think we all have those challenges, like all nations have them also. The two assassins that appear at the beginning of the film seem to have been taken out from a piece of news in a Latin American paper. It's the same in Spain. There are people who, all of a sudden, kill one another with machetes, who kill their families, I don't know why, for no reason. Or people who do something horrible and the neighbours say "I don't know, he was a good man, very kind, he gave me milk, jam and the next day he killed all his family". That isn't an American thing exclusively, or Argentinean, or Spanish. I have also worked in Morocco, in Egypt, some friends of mine are Arab, and there is a thing among men, the way they treat their wives and daughters, that is unbelievable. It's a barbaric thing, but it still exists, and the Japanese who are so intelligent, from a supreme culture, ancient, repectable, they also mistreat women like the worst men in the world. That's very interesting. Human beings are very strange, very intelligent, and sometimes, extremely terrible. I think those are the things that interest Cronenberg, he's an expert at observing it and showing it. Back to Alatriste. How did your old Castilian turn out? It was hard, but I had time to prepare it. At first I was a little nervous, I didn't want them to tell me it's ok, I wanted them not to think about it, just to accept me as one of them. I always feel the responsibility of contributing to the story, of telling it well with them, of helping, of not hindering the director from telling the story the way he wants to. I was the only person who wasn't a Spaniard, besides an Italian actor, whose character was from Sicily and he's a Sicilian. I was the only foreigner, and playing a character who is very dear to the Spanish, who has his fans. In the same way that Tolkien fans had, I guess, very fixed ideas of what Lord of The Rings was, but as I hadn't read the books I had no contact with those people. I didn't worry too much, I did my work, and fortunately most people liked it, I think. It was the same with Alatriste, you cannot do it for them, you have to do it like you think it has to be done, with the help of the director and the other characters, the other actors, but I felt the pressure to do it well, culturally well, to speak correctly. Alatriste is a very interesting project for Spain, the highest budget in the history of the Spanish cinema, similar to Lord of the Rings, because before doing it, New Zealand hadn't had the experience of working in a period film, and that big. Hardly anyone had done that, and they hadn't shown the capability to do it with their previous films either. It was a risk New Line took. So it was for Agustín Díaz Yanes. The films he had made before are nothing like this one, this budget, swords, horses, every detail. Alatriste for Spain was like Lord of the Rings for New Zealand, and although they have always had good technicians who work in Hollywood and other places, and in their own smaller movies in Spain, they hadn't been able to show the world that it can also be done here. Like they did in New Zealand, we also can over here, like in Australia, or the United States, or Europe. I think the Spanish are going to be very proud of what they have been able to do, and as an actor I wanted to work with all these actors, with this cast, with Ariadna Gil, with Javier Cámara, with all these good actors, I would have to do five or six movies over there, but Díaz Yanes could convince them and get them together because he had a good story for everybody to work together in this project. I mean, being able to work with everyone of them at the same time was an incredible gift for me. My character works with all the main actors. Are you aware that probably that budget was raised because you were in the film? Yes, I know, it doesn't help to take off the responsibility of seeing whether I'm going to screw all this up, whether I'm going to ruin it because I couldn't find out how to do it well, how to speak well. But shortly after, I forgot most doubts and we got into work and had a very good time. It sure helped me a lot that Agustín was such a good director, that his script was so good and also being able to work with these actors who supported me always, they helped me a lot.